The Danish operator is due in Season 2 of Year 4. 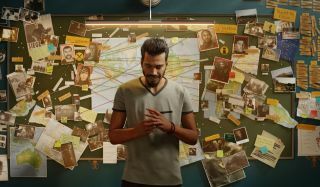 Ubisoft's latest Rainbow Six Siege teaser reveals that the upcoming Danish operator, arriving in Season 2 of Year 4, will be an “expert in covert reconnaissance and stealth tactics"—and also suggests that a proximity alarm gadget will come to the shooter soon. The image is taken from a trailer Ubisoft released last week, but this version is much higher quality, allowing players to zoom in and pick out small details. Towards the bottom left is a map of Denmark, over which is a post-it note hinting at stealth skills and the ability to "blend and adapt" to the environment. Could that mean some kind of cloaking device? We'll have to wait and see. The info also appears on the attacking side of the board, which means the Danish operator is likely to be an attacker. The other tease is at the far left of the image: it's a piece of blue paper that lists the game's gadgets, and on there is a "proximity alarm", with a red arrow pointing to it. No such item is in the game at the moment, but it's not hard to guess how it'd work. Place it down to watch your back and it'll tell you if an enemy gets near, is what I'd imagine. For more details on Siege's upcoming Australian operators and their gadgets, click here.